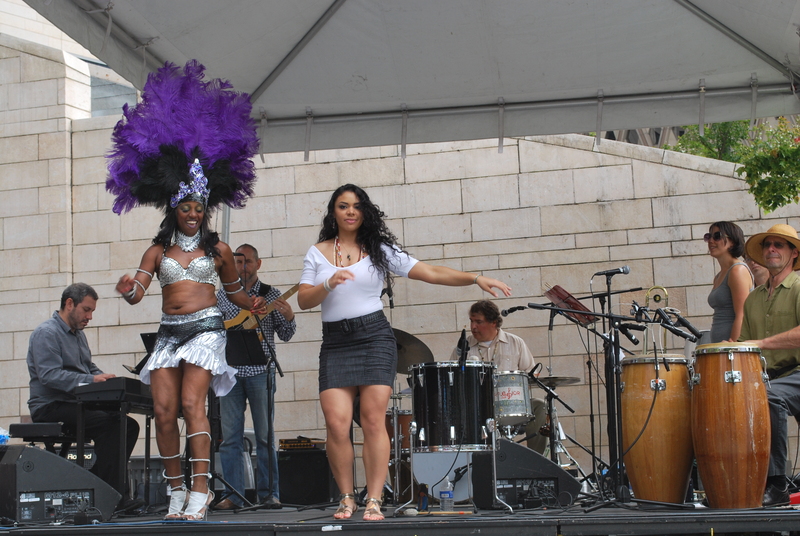 Dance to music from Brazil and the Caribbean with Sambatuque, noon to 1:30, this Thursday, Aug. 2, at Seattle City Hall’s outdoor plaza, 600 Fourth Ave. The show is part of Seattle Presents, a free, lunchtime summer concert series. Check out the complete summer lineup here. Sambatuque (samba-too-kie) draws upon the rich and subtle beauty of Brazilian harmonies and the powerful rhythms of Brazil and Cuba to create songs that are uplifting and infectious. Singer/dancer Mikaela Romero fronts the quintet that performs a vibrant mix of world, samba, jazz and soul music. Romero’s strikingly pure and rhythmically precise vocal delivery has led her to perform with Seattle’s top Cuban and Brazilian bands, including Grupo Ashe, led by Cuban drummer Pedro Vargas, and Banda Alecrim, led by Brazilian pianist and three-time Latin Grammy nominee Jovino Santos Neto. With influences from artists like Bob Marley, Celia Cruz, and La Lupe, Sambatuque presents a unique, delectable sound. The band includes drummer/composer Jeff Busch, whose work with musician Jovino Santos Neto saw them nominated for a Latin Jazz Grammy in 2004. Pianist Alex Chadsey adds elements of Afro-Cuban and Puerto Rican flavor to the band’s Brazilian blend. Bassist Tim Carey, a versatile player and outstanding soloist, adds highly rhythmic and lyrical dimensions. Conga player/percussionist Denny Stern has been working with Brazilian, Cuban and West African drum and dance ensembles for more than 30 years. His creativity and spontaneity add a raw roots feel to the band’s groove. Soak up the sun and the sumptuous voice of Seattle singer-songwriter Shelby Earl at a free, all-ages concert 12 to 1:30 p.m., Thursday, July 19, on Seattle City Hall’s outdoor plaza, 600 Fourth Ave. The show is part of Seattle Presents, a free, lunchtime summer concert series. Go here for the complete lineup. Seattle Present concerts are in partnership with Seattle Parks and Recreation, Metropolitan Improvement District and Triamp Group.